She was seriously nectaring just steps from the trail. I knew that I had seen this species before, doing just about the same thing at agricultural roads north of Binyamina, Israel. This immediate beauty flew several hours north of Binyamina, along the slope of Mt. Meron. As throughout most of Israel her overall experience was beautiful weather and zero human conflict. When we posted this species earlier, we were impressed with the eye-popping number of visits that followed. Lots of folks wanted to see this one, first identified and named by Guerin in 1849. He named it A. Jesous. Today is December 25th. 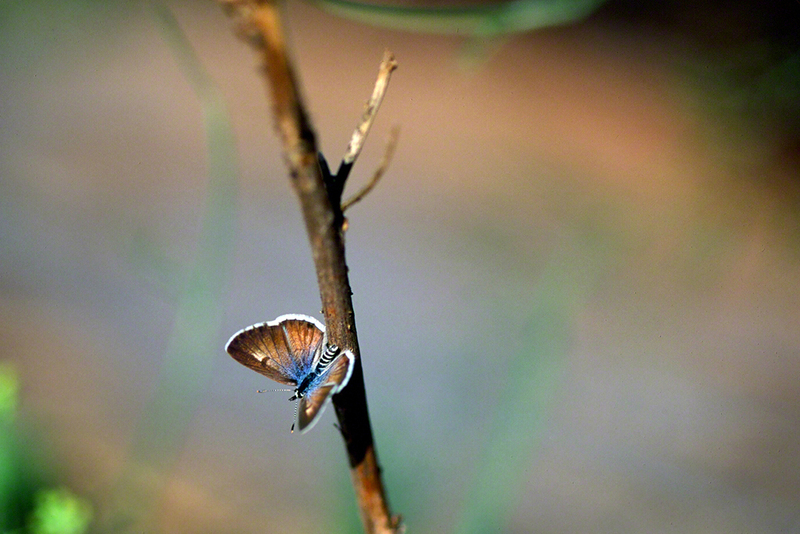 A tiny butterfly, they sport many black spots on their hindwings, and a curious brown streak on their forewings. Their caterpillars are tended/protected by ants. Seen in early June. Some species maps show their northern limits to be just south of where I was, but there she was on the mountain. 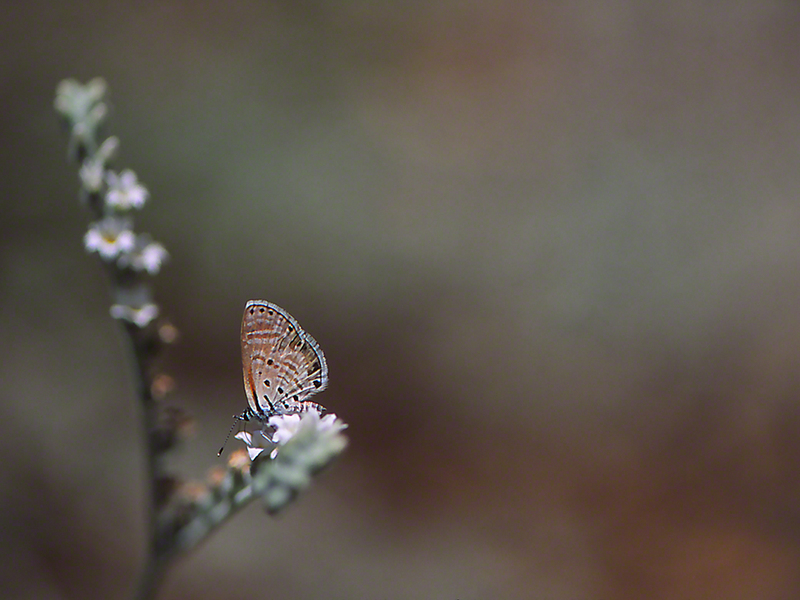 This ventral (underside) view of this small and very pretty butterfly complements our dorsal image post. She’s fully occupied, drinking nectar from Camphor weed. Her hindwing eyespots feature striking little silver-blue scales. A very nice touch on an already beautiful butterfly. 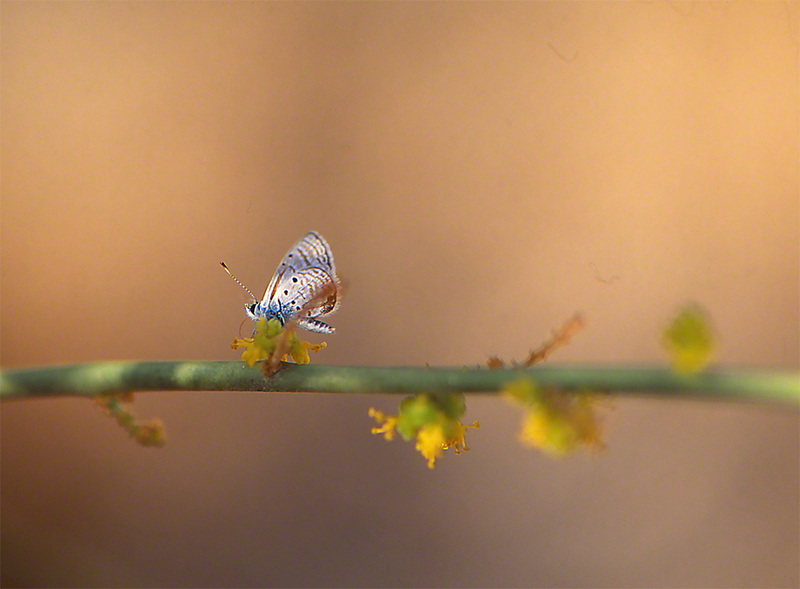 This image and other Binyamina, Israeli butterflies are satisfying for us to photograph. We walked the agricultural field roads, camera in hand, expecting minimal success. We were rewarded by finding young and active butterfly populations, despite the November dates. What are these butterflies common names? We continue to wait for feedback from Israeli friends and family. Azanus Jesous and Azanus Ubaldus are among the most viewed of all of the 187 posts on wingedbeauity.com. The most obvious reason for that remains something of a mystery. 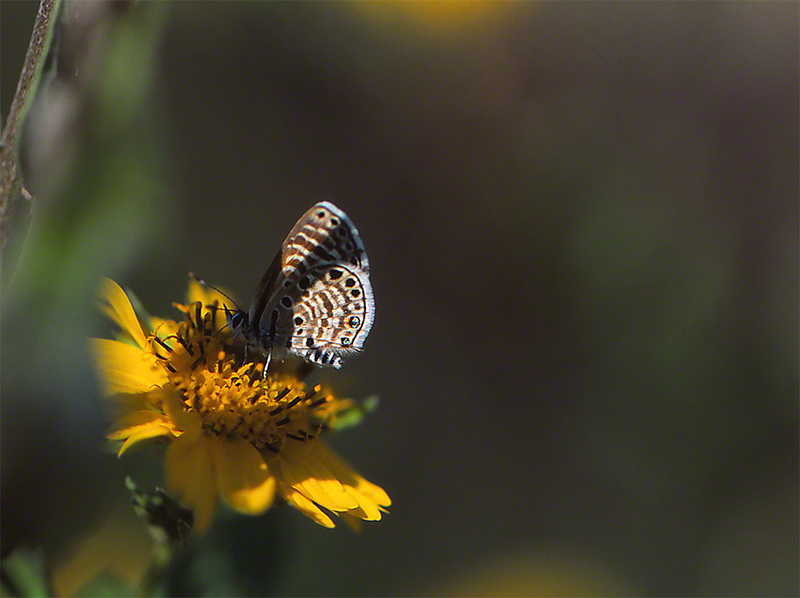 The butterfly flew onto a dry wildflower stalk, just several feet to my left. She was tiny, and she was all decked out. The butterfly caught my eye immediately, as I am now trained to notice wing movement. I am also wired to note unique butterflies. With her coffee colored wings, the Greek Offshore islands blue coloring, the spot on each forewing, her perky posture, the milk-white outer edges of wing, and that richly shaded body with it clown-like abdomen, who could not appreciate this siren, posing on a farm road in Binyamina, Israel? What butterfly species was she? Field guides are just to heavy to lug into the bush, but now we know that she is a female Azanus Jesous. Found in western Israel, Gaza, northern Israel and the western and southern shores of the Sinai Peninsula, this example is an especially fresh example. Good. Ah, such successful fieldwork.